Hilton (NYSE: HLT) has signed a franchise agreement with HRMP Schaffhausen AG to open Hampton by Hilton Schaffhausen. The 112-room property is slated to open in 2021 as part of a new multipurpose development in Herblingen Business Park. Patrick Fitzgibbon, senior vice president, development, EMEA, Hilton said: "Schaffhausen has excellent transport links and is a commercial hub for international companies in the region, including UBS, IWC Schaffhausen and Georg Fischer. The hotel will help meet the increasing demand for quality and affordable accommodation for business travellers, as well as those visiting Schaffhausen for its picturesque architecture." The hotel will be located 30 km from Zurich Airport and just 230 m. from Herblingen railway station, where travellers can take a direct train to Zurich. Schaffhausen boasts several tourist attractions - Rhine Falls, one of Europe's largest waterfalls, which attracts thousands of visitors per year, while Schaffhausen's old town is widely regarded as one of the best preserved medieval towns in central Europe. Miroslav Vuletic, Managing Director, HRMP Schaffhausen AG, said: "This development in the Herblingen Business Park provides an exciting opportunity to bring an internationally recognised brand to a region experiencing significant investment, from both private companies and the state, who are relocating several head offices to the area. 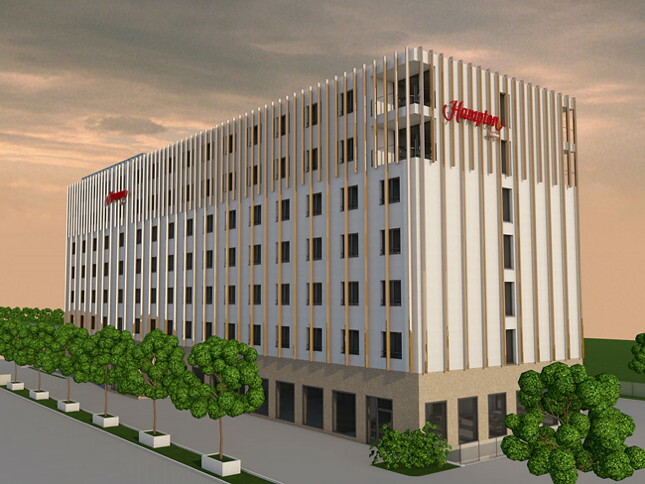 We cannot wait to welcome guests to Switzerland's first Hampton by Hilton hotel." In 2017, Methabau Totalunternehmung AG, the developer of the Hotel, also developed and opened the LIPO Arena, the home ground of football team FC Schaffhausen. The stadium and adjacent 700-capacity Schaffhausen Centre events space are located within walking distance of the hotel and promise to draw visitors throughout the year. Offering guests high quality amenities, including complimentary Wi-Fi and hot breakfast, Hampton by Hilton Schaffhausen will also include several meeting rooms and a work zone. This hotel will mark Hilton's fourth property in Switzerland joining Hilton Zurich Airport, Hilton Garden Inn Davos and the soon to open Hilton Garden Inn Zurich Limmattal. Hampton by Hilton Schaffhausen will be located in Industriestrasse, 8207 Schaffhausen, Switzerland. Are you with Hampton by Hilton? If you are a member of Hampton by Hilton you may be interested in learning how to optimize your content on our network.